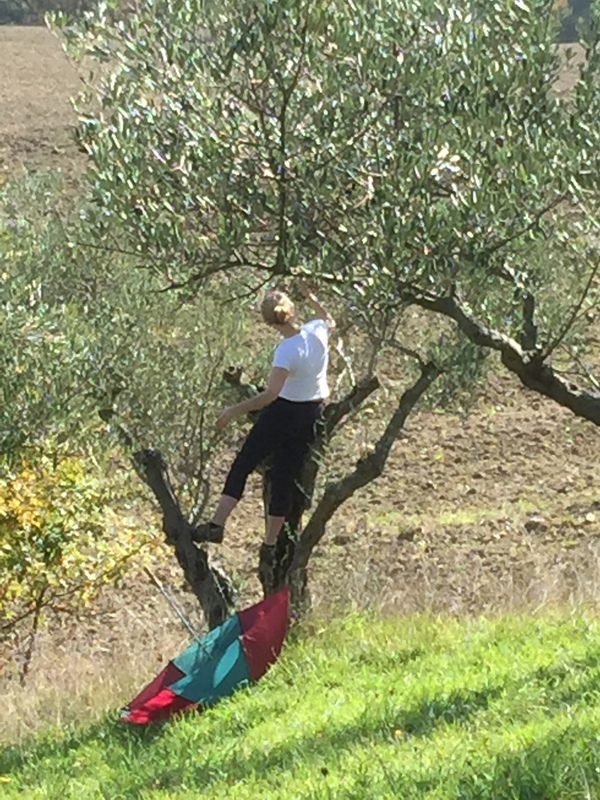 It’s November and I’m in Italy, so it must be time for the olive harvest. We’ve had a house out here, with an olive grove, for about 5 years and so a trip out to do the olive harvest has become a wonderful autumn ritual. That is apart from last year when the olives were attacked by some oil drinking bug, and they all shrivelled up and fell to the ground. For us a disappointment, for our Italian neighbours a major concern. So this year I was delighted to hear that there was little sign of the oil drinking critters and the olive trees were looking great. 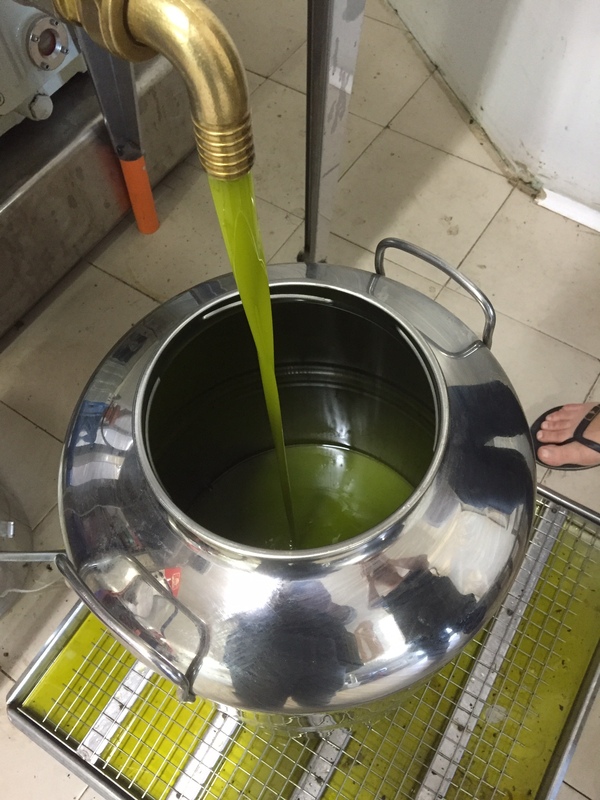 2013 – the year of the intrepid olive picker! October had been a cold and wet month in our area of Italy this year so I was a bit apprehensive about the chances of us having good weather for the harvest. Over the last few years harvest weather has been mixed, to say the least. In 2013 I had brought over a group of three female friends to help with the harvest. My lovely Auntie Ann, who is a fabulous cook, came to cater for us and the others were to be pickers, joined for some of the time by my friend and house manager, James. The weather was so lovely and the sun so warm that one of my friends, who shall remain nameless, decided to pick the olives in her bra. Two days later we had 18 inches of snow fall over night. 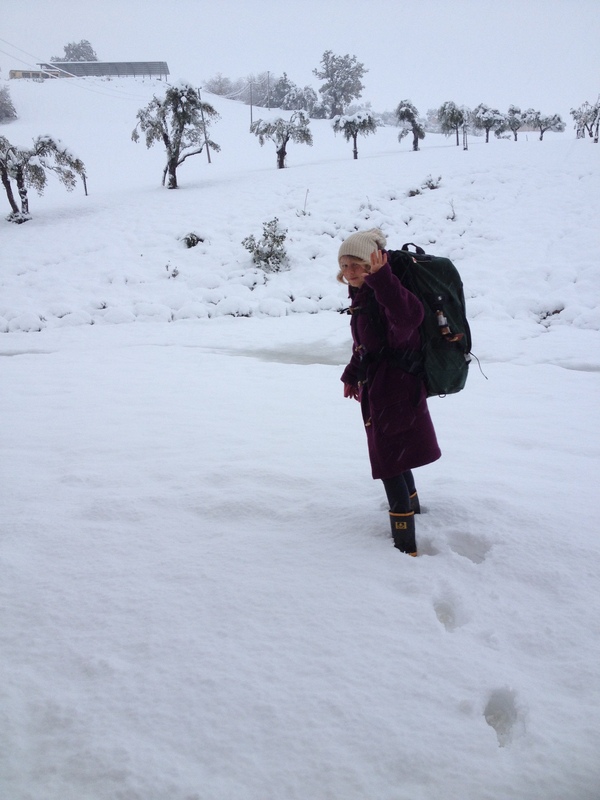 How we managed to get up our very steep, half-mile long, drive with 15 litres of olive oil in 18 inches of snow, borrow our sainted neighbours snow chains and drive around fallen trees and through snow drifts to get our plane home is maybe material for a future post! This year the forecast was good for the week we were planning our harvest – and so it proved to be. I was joined by two dear friends, sadly no cook this time. She is busy with other responsibilities. We missed you, Auntie Ann. Usually, the harvest consists of two long and tiring days. 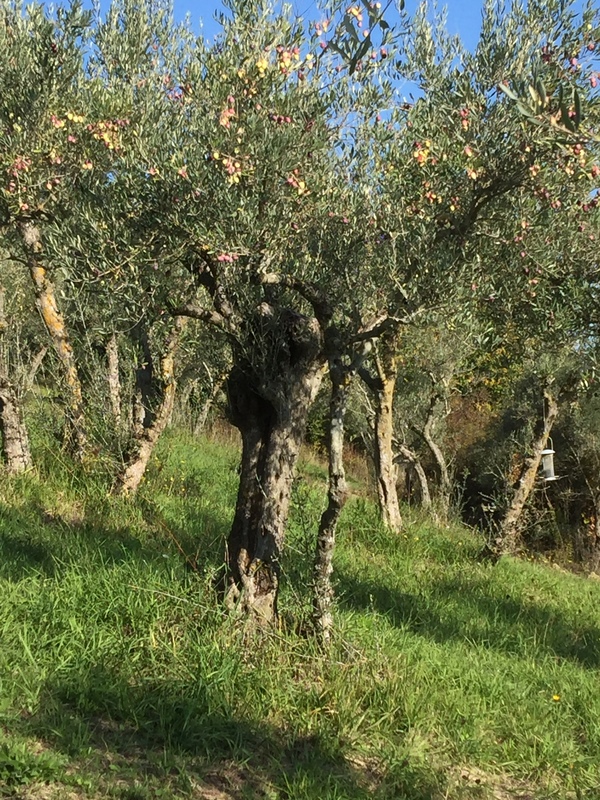 I have over 100 trees and most of them are in the olive grove which is situated on a slope. This makes olive picking quite a challenge. As you are standing on a slope all the time it feels as though you are in fact olive picking in high heel shoes. Not really to be recommended, even for the most fashion conscious amongst us. 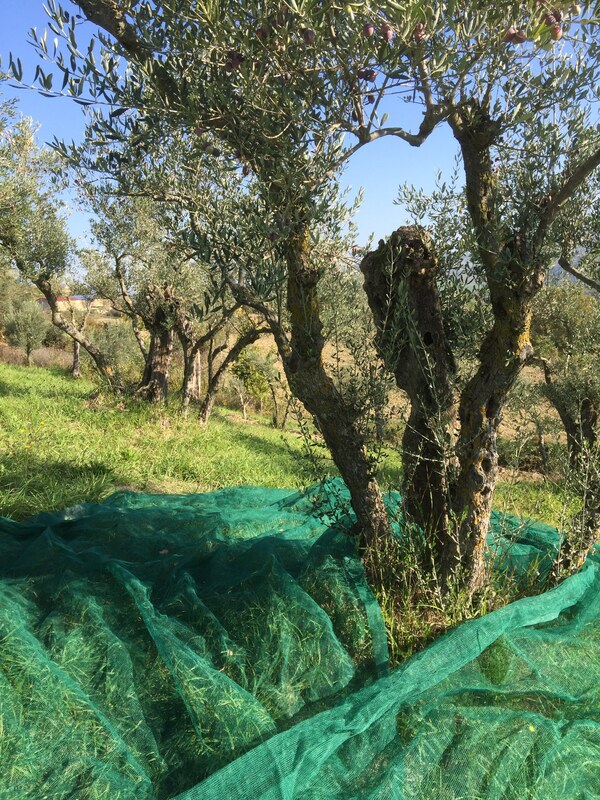 At this point, I want to counter a commonly held belief that olive picking just involves putting nets on the ground around the base of a tree and then shaking it. It does not! Olive trees do not readily lend themselves to much shaking and olives do not come away from the tree that readily. We use small plastic forks, designed especially for the job, that are held in the hand or mounted onto long wooden poles to reach those oh so elusive olives that almost always remain just out of reach, but you have to try. So definitely no shaking of trees takes place. We do, however, put nets down under the trees. On a 45 degree slope this has its own problems as any olives dislodged from the trees are going to roll off the net and down the slope. So we have to strategically place crates under the edges of the netting to catch any potential escapees. 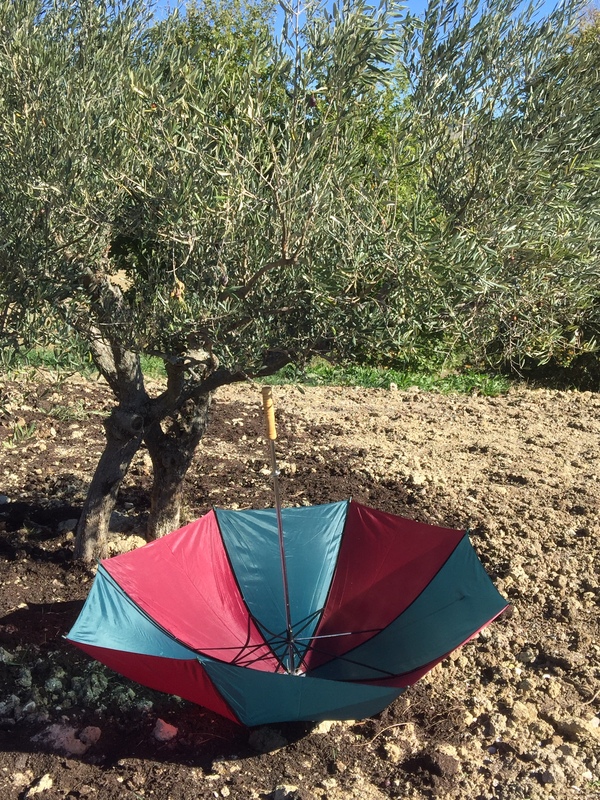 We also have a slightly more unconventional method of olive collection that I was introduced to by my friend and house manager, James, last year. It’s a method that only a Brit could come up with and involves upturned golf umbrellas, either hanging from the trees or the spike pushed hard into the ground underneath them. It works very effectively and also gives the farmer, who is invariably ploughing his field next door, something to smile at and no doubt talk about at the bar in the village later in the day. You soon learn avoidance techniques because when an olive lands on your head it’s amazing how hard it is. Fortunately, it was sunny enough for us all to be wearing sunglasses, which afforded some protection, at least to our eyes. You develop quite a technique for olive picking while looking in the opposite direction. Despite all the challenges, it’s very rewarding. As you pull your rake through the tree the olives cascade around you like multi -coloured jewels. Light green to dark cherry morello red. Absolutely beautiful. A whole crate is a work of art. 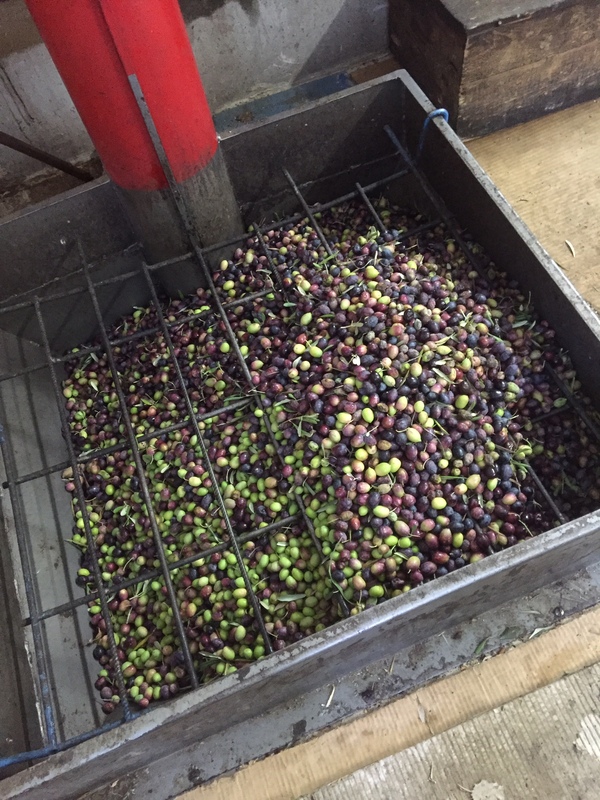 We run our hands through the full crates, removing leaves and twigs and feeling the warm, smooth, soft olives tumbling through our fingers. A full crate of olives is heavy, over 20 kilos, and they have to be carried back from the olive grove up to the house. It’s hard work. But we laugh a lot and pull together. Choosing the right olive picking companions is very important. Mine were fantastic! We also experience some frustrations. The odd overturned partially full crate, the heavily ladened branches just out of reach, even to the tallest of us, with the longest rake. Occasionally we decide to do some pruning at the same time as picking. But this is always initiated by seeing lots of olives just out of reach at the top of a branch. A saw is collected from the store and the branch is downed. We start our picking furthest from the house and on the steepest part of the grove so as tiredness sets in we are moving onto easier trees in less challenging environments. 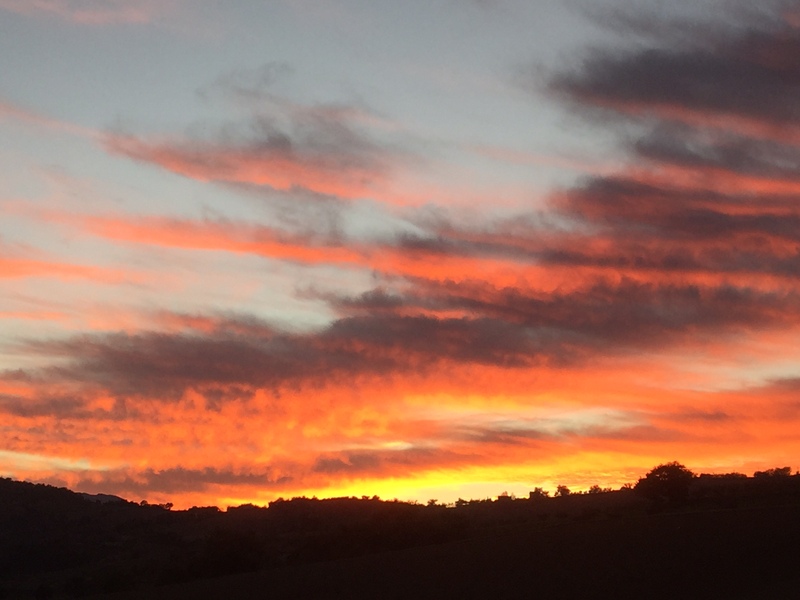 Fortunately, despite the warm sunny days, sunset arrives fairly early. Very suddenly it gets dark, so we have the perfect excuse to bring our toiling to an end for the day just after 5 pm. We have been known in previous years to pick by torch light just to get those last few olives in. But not this year. We bring up our crates and then head for a hot bath and out to dinner at our favourite pizzeria. The next day we do it all again. 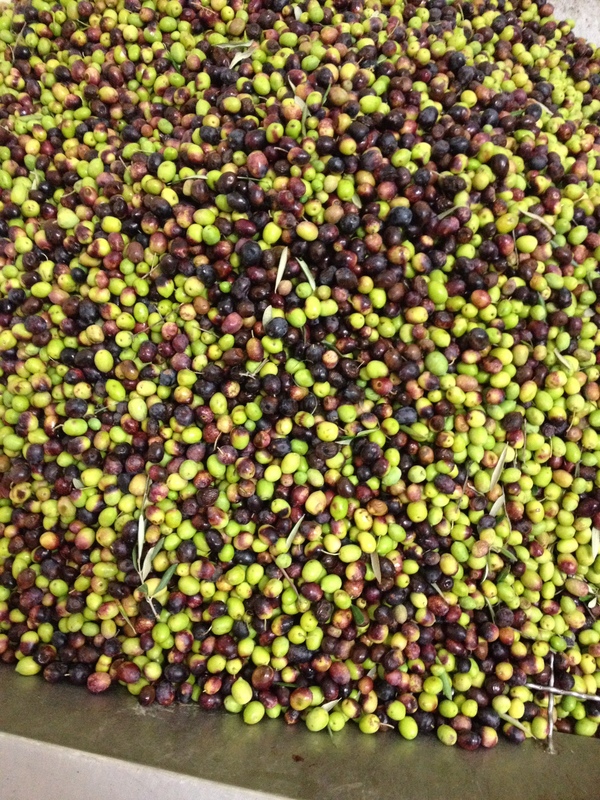 This year we picked over 172 kilos of olives in two days. An appointment was made at one of the olive presses in the village for the following day. When I say appointment, you wouldn’t really know that such a system exists. You arrive and you unload your olives and hang around. It seems a very first come first served sort of arrangement. 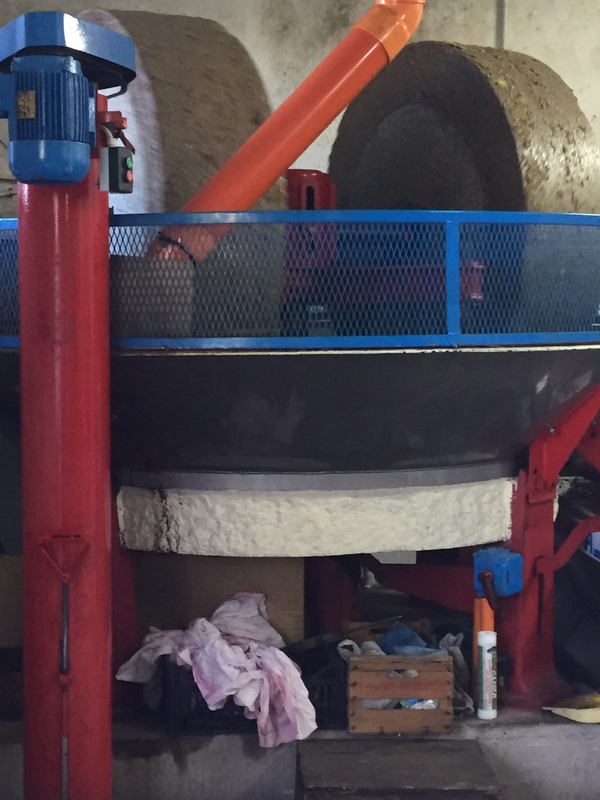 The olives are weighed and then poured into a hopper where they are sucked up a tube and end up underneath some very serious looking huge rotating stones that crush them to a brown pulp. 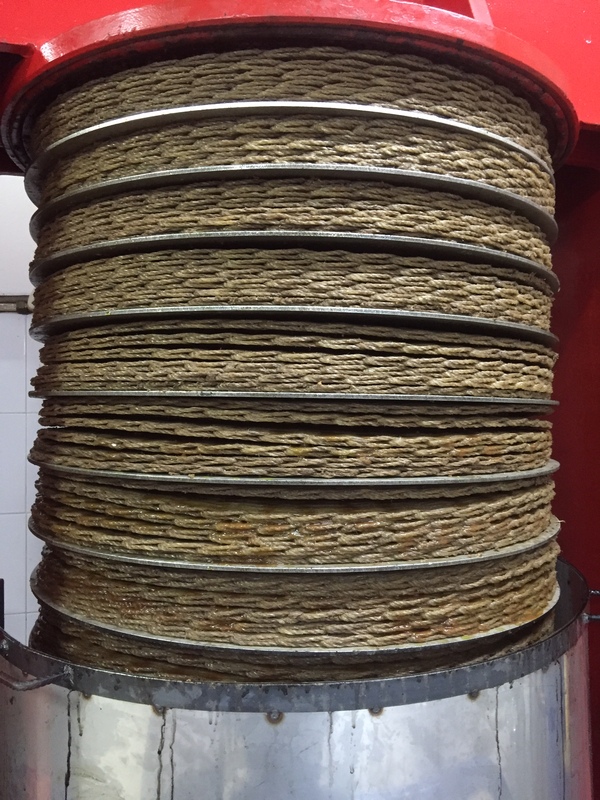 The pulp is poured onto rush mats which, once they have formed a tower, are put under great pressure. After walking up and down for a couple of hours, trying to keep yourself amused, miraculously a bright, golden-green liquid starts to pour into your churn. It smells like fresh grass and has a great peppery kick which will mellow over the coming months. It’s like magic. Being English always creates some interest at the press, especially when your yield is quite a bit better than anyone else’s that day! Very proudly we set off home with our empty crates and 33 litres of olive oil. The next day, as we are leaving for England with 16 litres of the oil well bubble wrapped in a suitcase, we look wistfully at those olives still sitting high in the branches of one or two awkward trees and promise ourselves that next year we will work out how to reach them. But for now the harvest is over for another year. The cans of oil made it back to the UK in tact. I’ll book you for next year right now! We did have a great time. The best olive oil I’ve ever tasted! Great team work, great trip!